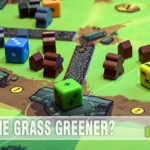 When I first started playing games more seriously a few years ago, I reveled in the standard dice and token style strategy games. While some were more advanced in game play than others, I often took on the challenge of games completely foreign to me because I could find some recognizable aspect of the game to take comfort in. There was one genre of games that I felt the need to avoid: deck building games. These types of games are unlike anything I was familiar with and the concept of no consistency between players threw me for a loop. There wouldn’t be opportunities for me to ask questions because each player’s hand and therefore strategy would be different. The entire idea overwhelmed me. I gradually worked my way into the game type as I realized I was making it more difficult than it really was. The themes range from space to word games where each turn players take the designated number of cards from the top of their deck, follow the card directions, purchase new cards then set them all aside to eventually become part of their playable deck. Using apps to learn the theories of deck-building, I’ve honed my skills and have welcomed them into my gaming world! One of the latest additions to our game collection is Flip City by Tasty Minstrel Games. For those of you familiar with deck-building games, Flip City is best described as a cross between Machi Koro and Star Realms. For the uninitiated, consider it war on steroids crossed with press your luck. 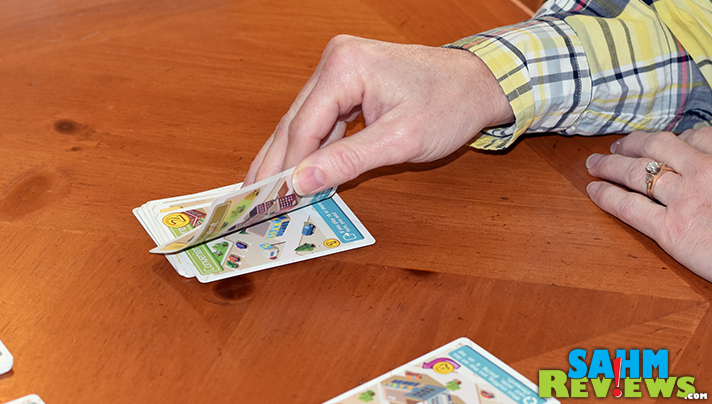 Unlike most decks of cards, Flip City is double-sided. 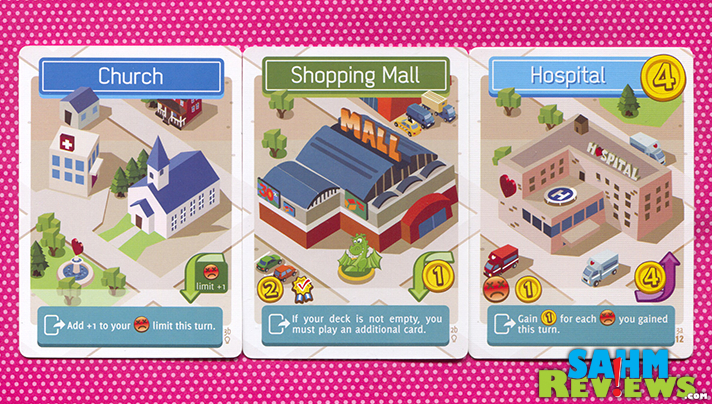 There are 6 different types of cards, each with an alternate building on the flip side. Each player starts with the same basic 9-card deck which is shuffled then ready for play. The key is to keep the correct side face up. 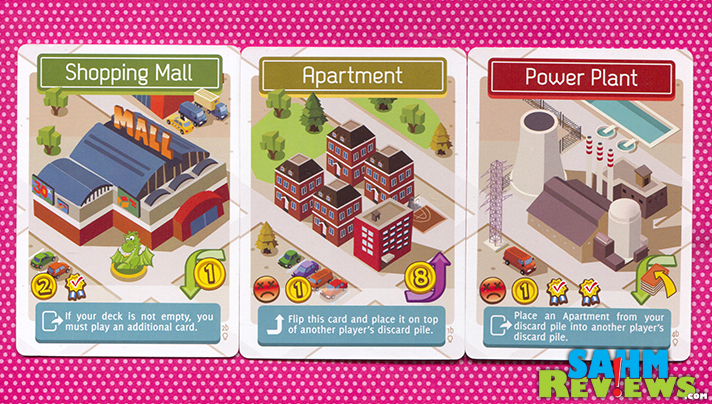 The flip side is an action that has to be purchased with the coins displayed on the cards the player opts to lay down. That’s where things get interesting. Each card displays a few different things: the building cost, fee to flip to the reverse side, function and what you ‘earn’ for that card. Some cards earn you money to buy or flip cards, some earn points used to win and others earn unhappiness dictating the end of your turn. The unique thing about this game is that you don’t have a set number of cards to play for your turn. The functions on some of the cards indicate whether you need to continue to play but for the most part, you can stop at any point, collect your coins and purchase a new card. If you continue to press your luck and end up with too many unhappy faces, your turn is over and you forfeit any money you had earned on that turn. Like other deck-building games, there are a number of different strategies and approaches combined with a bit of luck depending on how the cards are shuffled. You can focus on acquiring the points needed for the win or you can work to sabotage the decks of your opponents. Of course, they’ll also be working to mess up your plans as well! The path the players choose to take helps dictate the duration of the game. Ultimately, the first person to achieve one of the end-game goals wins. Tasty Minstrel Games has become one of our favorite publishers consistently churning out quality games such as Scoville, Village and AquaSphere. We should have known we would enjoy this one too! 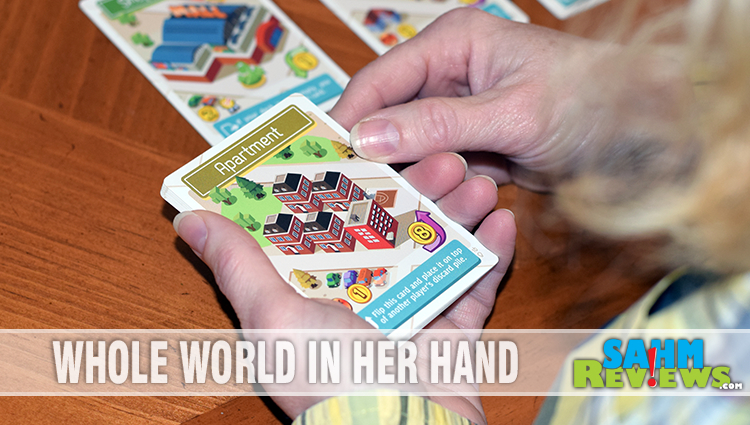 If you’re looking for a deck-building game that comes in a small package, Flip City is a quality option. The simple theory of building a city makes this a good introduction to deck-building but also requires enough strategy to keep seasoned gamers happy. 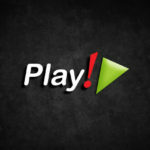 Check out Tasty Minstrel Games on Facebook and Twitter to learn what new games are on the horizon. We’ll be bringing you our thoughts on Cthulhu Realms, another one of from their deck-builder series. Stay tuned! Are you ready to flip for this deck-building game? Where’s the Drinking and Free Beads? We really enjoy Machi Kori and if you say that game is a cross with star realms, we so need it! I’ve played a bit of Star Realms and it didn’t go too well. I’ve been willing to play something like Legendary Encounters or Legendary: Marvel, perhaps those would be more up my ally. Or perhaps deck builders just haven’t clicked in my head yet. I’ll keep this one in mind if I come across it. This deck game seems like a promising alternative to some of the online game simulations with similar objectives. My girls are too small for deck games still, but I’ll definitely remember this for the future. The Tasty Minstrel Games are fun and exciting. My kids will love this game. I don’t think I’ve ever played a deck building game and it does sound rather complicated to me. I could probably learn to play it-but it would take a while! This does look like Flip City is a great game for both young and old. It is similar to some online games, so I guess it won’t be too hard to learn. Thanks for the review. I have never played a game like this before. I think my oldest would like it, but my little one, who is only 8, is probably a little too young. I like that this is taking an online concept and taking it into cards. Looks like a great way to get around the table with the entire family. Wow, that looks like an engaging and fun game to play. We don’t really play card or board games at home, except for around the holidays – might have to look for this one! I love TMG games and this one is getting a lot of hype lately and has moved to my top want games! I think my boys would love this game. The concept behind it seems like it is a lot of fun. I love finding new card games. Flip City looks like this would be one my family and I could have a great time playing. You always have the best review of games. Most I have never heard of, but after reading your reviews I need to buy. Thanks for always being honest in the review it helps me find what I like. I’ve never played a deck-building game before, but I have friends who have. This one looks like something I could get into. Sounds like a very interesting game. I bet my hubby and my daughter would like it. This is a unique style of game and I like that! I love the press your luck style when it comes to each turn – makes it suspenseful on what the others will do! This looks like a great game. I will have to share this with my friends. It will be a popular Christmas gift. I’m a little intimidated right now, but I have a feeling it gets easier quickly. I think I would really enjoy the strategy. This sounds pretty fun..I guess I’ve never really played deck building games before, or didn’t realize I was, but this sounds like something I would enjoy. 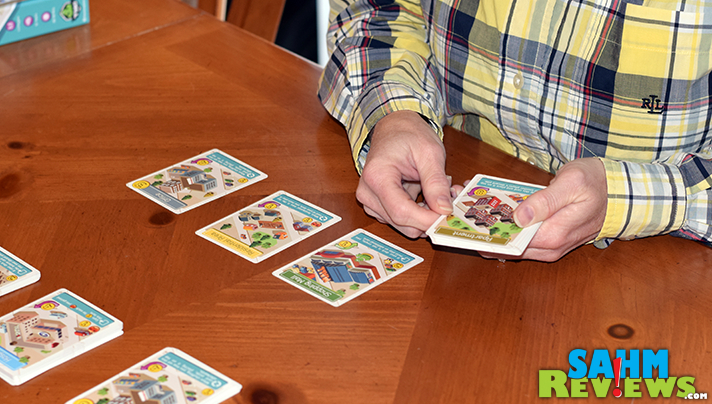 Flip City sounds like such a fun card game to play with family or friends. This would be great to have on hand as entertaining when guests come to visit and eat together for the holidays. That sounds like a great game to play! I think my kids may be a little too young to play, but it would be a lot of fun once they are a little older! I have not seen a card game like this before. Sounds like it would be a good game for family game night. I’ve never played a game like this before. It looks like a fun game to bring the family together. I like playing games. I’m always looking for new one s to play. I haven’t tried to played this before, I’ve tried the UNO card I think that was like this game. I’ve never heard of nor payed any deck building games. I think I may buy a few to see if it’s something I’d like. Cool! This sounds like a lot of fun! I find it interesting that players have to buy the cards. This game sort of reminds me of Monopoly in the business sense. I don’t know much about deck building but it sounds pretty cool. I’ll have to give it a try! I very nearly picked this up a few days ago. I’d like to play it first.